Intermediate/Advanced. 2 CDs and book. 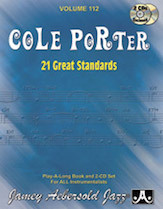 Cole porter was one of the greatest contributors to the Great American Songbook. Jazz players have embraced his compositions for their natural melodies, comfortable harmonies, and clever lyrics. Presented here is the most extensive play-a-long collection of his work ever produced!